A few months ago I watched a clip on the Today Show about Plugged In Parenting. I tried to find it online, but couldn’t, but I thought this would be a great topic to discuss. This picture says it all. Everyone in the family is using some kind of electronic device (all except the baby in the highchair). In this day and age our lives are so wrapped up with being “plugged in” that I think we lose focus on what is really important. How can you get to know your kids if your eyes are glued to the computer? How can your kids get to know you and their siblings if they are focused on watching tv, playing their Nintendo DS or listening to their iPod? Lack of communication is a huge problem today in the 21st century family. Both parents work. Kids are involved in lots of different activities like sports, dance classes, swimming, karate… Our lives are wrapped up in the internet through email, social sites, and work. So, when do we have the time to sit down and just enjoy eachother’s company? How important is it to unplug for a few hours and get to know those who are closest to you? How can we create a balance? We obviously cannot force our children to stay away from television and video games. And, as parents, we cannot get rid of the computer in our homes. Many of us work from home (like me) and the internet is essential. But you CAN set limits and create a family “plugged in” plan that works for you. I read somewhere that in one year the average child spends over 1,500 hours watching TV and or playing video games. That winds up being about 4 hours per day. And some actually spend more time than that. Craziness, right? I do have to admit that I do allow my kids to watch a few hours of TV each day (some in the morning and some at night). And now that we are in the summer months, it has become a nice diversion so that I can get my client work done while they are quiet. But I have to watch myself that I don’t get to involved in what I am doing that I just let them sit in front of it for hours on end. I mean, what ever happened to good ol’ going outside to play? That is what we did when we were kids right? Well, I have come up with a list of 5 ways that we can set limits on the use of electronics in our homes. Some of them may be harder than others, but I think it very important to at least come up with a plan that will work for you. 1. 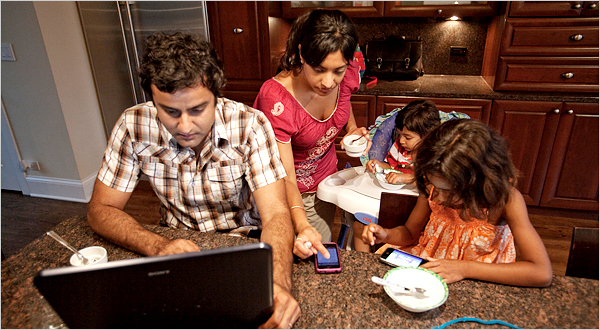 “Unplugged” Mealtimes – Remember the picture of the family above eating while working on the computer, talking on the phone, and listening to the ipod? This should be a no no. Even I have been finding myself having the TV on the background during breakfast and I am going to work on remembering to shut it off so that my children can interact with eachother instead of being focused on the TV. Dinner is the most important meal where it may not be possible to sit down together every single day. I know that parents have different work schedules and things like that. But if you are able to work in a meal or 2 together as a family each week – then definitely do it. I will never forget growing up and how important it was to my mom and dad that we all sat down each day at the same time to share dinner together. This created a wonderful family bond between us. And we used that time to discuss the day’s events. This taught me the importance of family communication and I want to carry that into my own family. 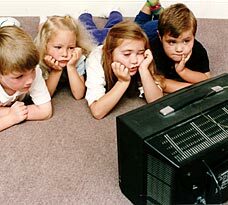 In this day and age, children now own their own TV’s, computers, cell phones, and other electronic devices. It is getting easier for a child to isolate themselves while using these things. As I said before, you cannot stop them from using them, but how about stopping them from WHERE they use them. For instance, keep the television and computer in an open area such as a living room or family room. This will not only help you to monitor how much time they are spending, but also WHAT they are watching. As we all know, it is way too easy to flip the channel to something that is questionable. This is a huge open door for the enemy to sneak garbage into the minds of our children. And if we can help protect them just a little bit now – then I think that is huge. Allowing a child to have access to their own TV and computer can be very dangerous. And we may not realize it until its too late. 3. “Unplugged” in the Car – With all the things that we are involved in, taking our children in the car a few times each day is inevitable. My children are not yet at that age where they have phones or iPods, but as I think more about these things – I feel like I would want to set limits with the use of electronics in the car. First of all, why does a child need to live with earphones on every waking moment? Can you say “isolation”? Why not listen to music together in the car? And how about the DVD players that are now equipped in many of the newer vehicles? I had to put my foot down with that a long time ago. My rule is that we only watch when we are going on a long ride or if mommy has to go food shopping and daddy and the kids have to wait in the car. Otherwise, it stays off and my kids know now not to ask. And this goes for parents too! I don’t yet have a cellphone that is connected to the internet. Yes, I am still in the dark ages. LOL I think if I had one, it would be WAY too tempting to be on it every waking moment. But if your kids see YOU being distracted by your phone, texting, tweeting, checking email – then what kind of example is that? 4. “Unplugged” Outings – This is huge for our family. Because I work from home, I absolutely HAVE to get away from my computer and the internet. As a family we usually take weekends off. I try NOT to work on Saturdays and Sundays. I do check email here and there or shoot out a tweet or 2, but that is pretty much it. Sometimes we plan out family outings and we go to different parks or we just all get in the car and drive to wherever the car leads us. And electronics are banned. This is a great way to refresh your mind and take the focus away from work, tv, and other distractions. My kids look forward to these times and it really promotes family togetherness. 5. “Unplugged” DAY – Why not take a whole day each month and stay completely unplugged. Teach your kids that you can still have fun without watching tv, playing video games, and surfing the net. They need to learn how to entertain themselves without all the outward stimulation of the electronic world. Writing this post has actually helped me to put things in perspective. We will not always be perfect of course. Balance is never an easy task no matter area of life. But I cannot stress enough the importance of setting limits while your children are still young. We live in a world where being “plugged in” is the norm, but why not use that to set a standard for your family that will promote communication instead of tear it apart. How about you? Are you a Plugged In Parent? Do you struggle with keeping balance in the midst of this electronic age? What do you do to set limits in your home? I would love to hear from you! I completely understand this phenomena, being a work at home mom, and frankly being someone that enjoys plugging in myself, I have recently implemented “unplugged” mealtimes in addition to having always been bedroom and car ‘au naturale’. Even as adults society is doing a great disservice by always being plugged in. No one listens anymore to the sounds of the outdoors, or each other, which could lead to a disassociated society. Thanks for filling in the profile pict, but you forgot the hair standing up on ends! LOL!